Open the Settings app, tap iTunes & App Store, and tap Apple ID. Tap View Apple ID in the dialog that appears. Sign in to your iTunes Store account. Tap the Payment Type you want to use. Fill in the card number, expiration date, and billing address in the fields provided. Although you can use a debit card as your payment method for yourself, you must use a credit card as your payment method in order to add children to your family. Tap Done, and swipe back to the Settings screen. Open the Settings app, tap iCloud, and tap Set Up Family Sharing. The Family Setup screen opens and shows you as the Family Organizer. The family organizer invites other members into the family and agrees to pay for purchases they initiate. Don’t worry — you can set it up so that you have to approve the purchases first. If you want someone else to be the family organizer, set up Family Sharing on his or her device. Sign in with the Apple ID you want to use to share your iTunes, iBooks, and App Store purchases, and then tap Next. 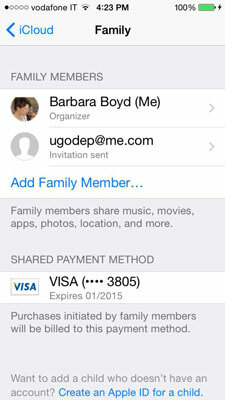 Use the ID that you use to make purchases, which could be different from the Apple ID you use to sign in to iCloud. The payment method you use for your iTunes account appears. Enter a password: The member you added can sign in to iTunes with the email address you used and then enter the password you assign. Send an invitation: An invitation will be sent to the person with instructions to access the account. To add a child who doesn’t have an account, tap Create an Apple ID for a Child at the bottom of the screen. When you add a child, the account is part of your family until the child is at least 13 years old. Tap Next and then agree to parental consent on the following screen. Enter the name and age of the child; Ask to Buy is on by default for children under 13. When the child wants to purchase something in the iTunes, iBooks, or App Store, a message is sent to you and you have to approve the purchase before it’s fulfilled. The charge will be made to the credit card associated with your iTunes account. You can set additional parental controls in the Settings app by tapping General and then tapping Restrictions. To delete a family member at any time, tap the name in the Family Members list and then tap Remove at the bottom of the screen. To cancel Family Sharing, tap your name in the Family Members list and tap Stop Family Sharing at the bottom of the screen. To access music, movies, books, or apps purchased by another family member, tap More in the Browse bar of the iTunes, iBooks, or App Store, and then tap Purchased. Tap the name of the family member whose purchases you want to access and then tap the item you want to use.